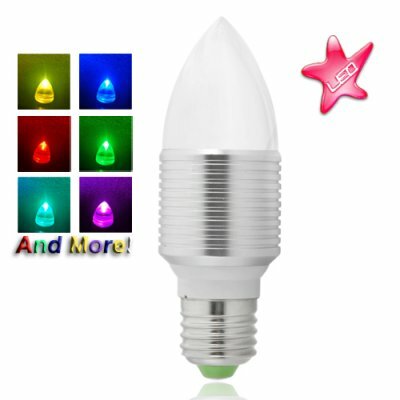 Successfully Added Outdoors Lighting LED Color Light Bulb with Wireless Remote to your Shopping Cart. Outdoors Lighting LED Color Light Bulb with Wireless Remote - beautiful, safe, efficient. Bars/Restaurants/Cafes: Set the LED light bulb to white during day and watch your establishment come alive at night. The 4 different modes allows you to instantly change the style and feeling to fit any event: Strobe mode allows you to set the mood for the more festive occasions, while fade is better for the more romantic ones. Waterfalls/Swimming Pools: Place this LED light bulb near your pool or sauna for years of maintenance-free color lighting. Along with 16 different colors, it's all you need to turn an ordinary backyard swimming pool into one of the Wonders of the World. Outdoors: Great when you want to spice up your garden and front yard or just give your flowers some much needed red light. Glamorous and durable, mother nature has nothing on this LED light bulb. Also feel free to place a few on your door to welcome visitors with an amazing display of color. Home: Replace your inefficient and easily broken incandescent light bulb with this powerful and durable LED light bulb, which will practically pay for itself due to the amount you save on maintenance and electric bills. This highly convenient and versatile Outdoors Lighting LED Color Light Bulb with Wireless Remote was designed to provide multiple options for your lighting needs at a low factory-direct price. In stock and available for bulk quantity orders now, get yours today and add color to your life. For use indoors or outdoors! How is this different from other LED color changing bulbs, like the CVSCL-8101 and CVCL-G55? This new version is waterproof and improved all around - take a look at the product notes! The best part, however, is that you'll be getting this at a low factory-direct price!